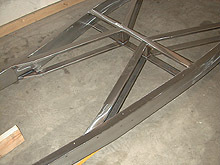 Our new Total Cost Involved Engineering (TCI) frame has arrived from Yogi's and is it ever pretty! I am truly impressed with the workmanship and quality. TCI was an easy choice. The clearance between the rectangular cross members allows tons of room for running exhaust, etc. and it's strong, boxed and beautiful! The cross members will make mounting transmision mounts and brake pedal assembly a breeze. Plans call for notching the front rails for added spring clearance, "C"ing the rear rails and bobbing them to blend with the body. We will also need to replace the rear shock mount cross piece with one that has a domed center to allow room for the quick change. 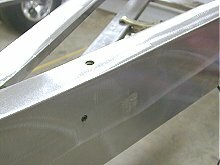 We took the first frame we could get instead of waiting for a custom built so there are threaded bolt holes for fenders and running boards. An easy way to fill these is with 5/16" x 1/2" long allen set screws. I found these for about 20 cents each. 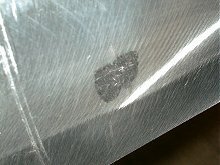 These were then threaded in until they had about 1/16" left protruding. 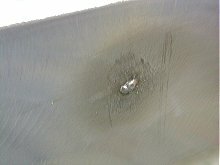 I then scuffed the heads off flush with an angle grinder to get a better weld surface and then welded them in place. 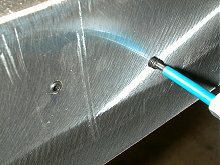 An angle grinder was used again to grind the weld flush with the rest of the frame rail. Here you can see one waiting to be filled and one that is finished behind it. Just like it was never there! This didn't take long. Next we'll notch the front rails.